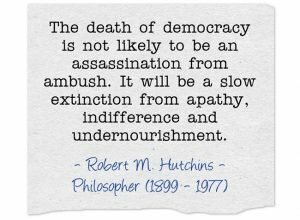 Democracy decline – it’s not just about elections! Democracy is in decline world-wide. Australia is now one of only 20 – twenty – true democracies according to the annual “Democracy Index” published by the The Economist’s Intelligence Unit. 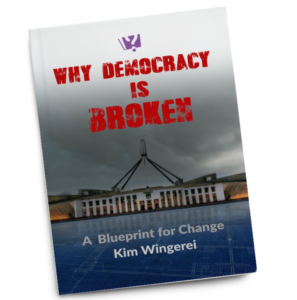 We cannot afford to be complacent and think that all will be well just because there is another election coming up – there is much more to a sound democracy than polling booths. The “Democracy Index” is a comprehensive report on the state of democracy around the world. The latest report warns that democracy is in decline after three decades of growth, and of the emergence of populist “strongmen”. Even in Australia we cannot afford to hide behind our proud democratic record – we cannot just show up at the polls, we need to engage. 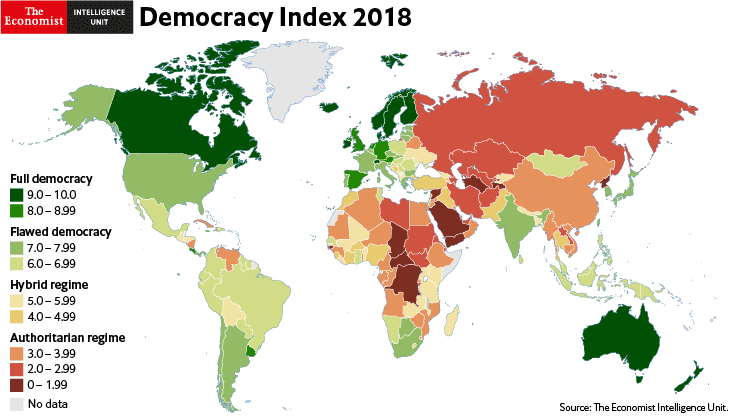 According to the EIU Democracy Index there are only 20 “full democracies” in the world – Australia and New Zealand are the only members of this exclusive club in Australasia. 14 of them are in Europe, and the United States – the self appointed defender of world democracy – is no longer regarded as a full democracy. The Economist divides the world’s nation into four groups. Beyond the full democracies, the next group is “flawed democracies”, followed by “hybrid regimes” – typically countries with pretend elections – and finally “authoritarian regimes”, where there isn’t even any pretense. At the very bottom of the list is the ironically named Democratic People’s Republic of Korea – aka. North Korea, the fiefdom of my namesake Kim Jong Un (no relation). Every country is given an aggregate score on a scale from 1 to 10. Norway tops the latest list with a score of 9.93, North Korea scored 1.08. Australia was ninth on the list with a score of 9.09, well below the fifth placed Kiwis, even without any help from the All Blacks. First published in 2007, the Democracy Index has waxed and waned over the years – countries move up and down the list as dictators are removed and others take control elsewhere, new constitutions are written, others ignored. Back then there were 28 countries considered full democracies, it peaked at 30 in 2008 and now stands at 20. The common thread of all three reports is how authoritarian regimes are on the rise – as evident most recently by the election of Jair Bolsonaro as president of Brazil, the world’s fifth most populous country. Bolsonaro is against secularism, opposes gay marriage, deplores homosexuality, is an outspoken racist and climate change denier and suggests torture is a legitimate practice. 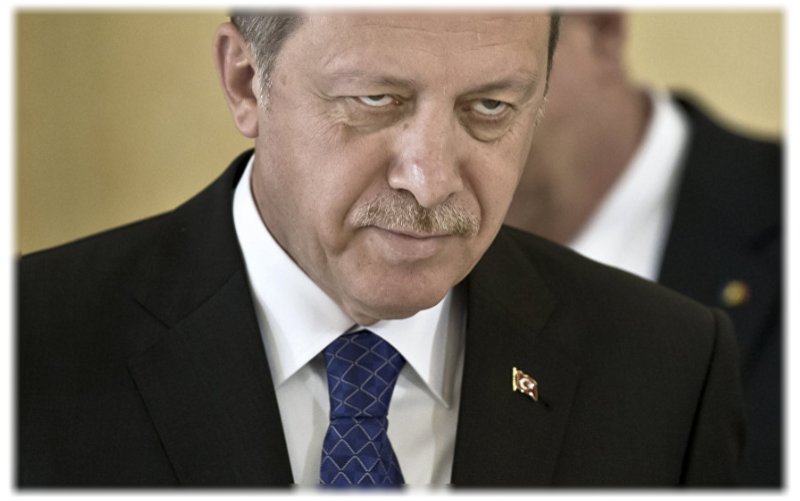 He fits in neatly with the likes of The Philippines’ Rodrigo Duterte, Turkey’s Recep Erdogan, Hungary’s Viktor Orban and Donald Trump – all democratically elected leaders with limited regard (and understanding in Trump’s case) of the institutions that they have been elected to lead. We can only hope that the democratic checks and balances in the US Constitution is enough to stop Trump before he declares himself emperor, but in the case of Brazil, Philippines, Hungary and Turkey the democratic pillars are on much less solid footings. With the exception of Turkey, the countries mentioned all have free elections – defined as everyone is free to vote and anyone can stand for elections without fear or favour, elections are held regularly and are secret ballots fairly monitored. Like most of the countries in the “flawed” group, they all have high scores in this category. Even some of the countries that are classified as “hybrid democracies” often have fair and sound electoral processes. Although many countries can do much better, the polling booth is generally not where democracy falters. This category is measuring how – once elected – executive Government is free and able to govern based on the authority vested in it by the elected body (Parliament, Congress, etc.) with reasonable transparency and not unduly influenced by other institutions (e.g. church or military) or by corruption. It also includes an assessment of the trust that voters have in political parties and the Government (based on surveys, where possible). Needless to say, the trust is in decline almost everywhere, although that may not be a bad thing for the long time survival of democracy, as it also fuels participation. This is the only measure that shows a sustained upward trend. Despite the ultimate disappointments of the “Arab Spring” it demonstrated that when given hope, people in dysfunctional countries rose up and made their voices heard. 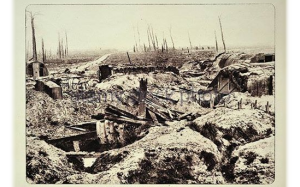 History has shown us that this is often how change eventually happens: the first revolution fails after a fiery start, the embers keep on burning and people power eventually prevails. The other driver of the political participation index is the still slow, but steady increase in the number of women elected. That said, we’ve got a long way to go when top score is measured at more than 20% of representatives. It’s clearly not just the Australian LNP that have yet to get that memo. This is the area of most concern and where the cracks to democracy invariably first appear. It covers basic human rights, including the freedom of media, freedom of association, freedom from discrimination, the independence of the courts and degree of secularism. As we have seen in Turkey over the past decade, Erdogan has used his majority to erode democratic rights by removing Parliament’s control over the executive, neutered the courts and generally eroded civil rights. He has curbed press freedoms, prosecuted journalists and persecuted minorities – defined as anyone who either don’t agree with his views or are not of the “correct” Islamics faith. It is a similar story in Hungary where Victor Orban, who clearly got so tired of being in opposition that when he finally became Prime Minister for the second time, he had sufficient majority to make constitutional changes to prevent amendments to legislation enacted by his government – including weakening the role of the courts. The Hungarian Constitution protects freedom of speech in theory, but state owned media and new laws introduced over the last few years have, if not completely silenced opposition voices, significantly curbed their capacity to report freely. Australia and many of the other “full democracies” score a perfect 10 in the Civil Liberties category, suggesting it is a somewhat defective measurement as no country this side of Utopia can claim to be squeaky clean on human rights. Our treatment of refugees may technically not be deemed “undemocratic”, but they are certainly inhumane. And as the EIU report was compiled before the draconian cyber security legislation was approved, I’d suggest it is a score we will not maintain when the next report is published in 12 months time. We should be proud of – and thankful for – being a “full democracy” – it’s a privilege a majority of the world’s nations don’t enjoy and mostly never have. It is easy for us to forget that most countries don’t have a culture of free elections, a well functioning government, high degree of participation in the public discourse and strong protections for civil rights. Establishing a strong democratic political culture takes generations, but it can be quickly dismantled. India is the world’s largest democracy and does have a relatively strong political culture, maybe the most valuable legacy of British colonial rule. As does our nearest neighbour Indonesia. Both countries have their own challenges in maintaining that status as they have elections coming up this year. India’s Prime Minister Modi has been criticised for heavy handed tactics against a fractured opposition and corruption is on the rise in a country that despite its economic growth, is a very long way away from according equal rights to all its poor and all its minorities. A re-elected and emboldened Modi may well go down a less democratic path. Indonesia has come a long way since the fall of Suharto in 1998, but it remains a country divided by religious fervour and dogma, still a fair way away from a secular democracy with equal rights for all. China, the world’s most populous country – and arguably most powerful – scores a predictable zero on electoral processes and not much better on civil liberties, but relatively high on the political culture scale. The EIU attributes that to the Chinese people having little desire for a democracy – a form of government they have never experienced and thus have little reason to believe in. Many like what they’ve got. In Australia we may believe that improvements in our national fortunes is no further away than the next election. But that is a fallacy as our democracy is also under threat by politicians putting their self interest first, heavily influenced by lobbyists, special interest groups and donors, increasingly blurred lines between the legislature and the executive, and a senate that no longer serves as a house of review, but as a chamber of obfuscation. We cannot afford to be complacent. It is not a far stretch to think of Peter Dutton and others of his ilk as people who share not just some of the beliefs of an Erdogan, Orban or a Bolsonaro, but also their ambition. The huge chasm of distrust between the electorate and our representatives is growing, and will only be narrowed by increased and sustained participation of engaged voters. 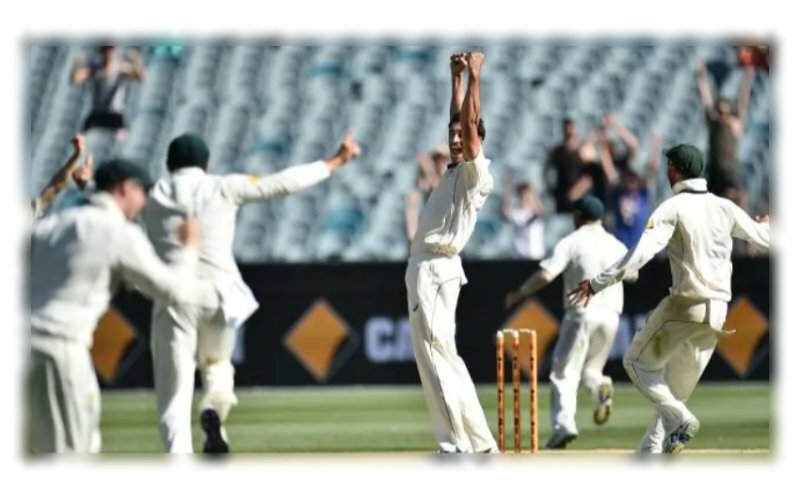 As much as we like to talk about the failures - or absence - of political leadership in Australia over the last decade, there is an equal dearth of responsible and accountable leadership everywhere - including in our favourite sport - Cricket. Democracy is under threat. From Vienna to Washington, Caracas to Istanbul, men with scant regard for the institutions that uphold democracy have been elected, threatening civic freedoms not just in their own countries, but setting dangerous precedents for others to follow. Could it happen here? The first book in The Why Series is out now! A democracy upgrade is long overdue. 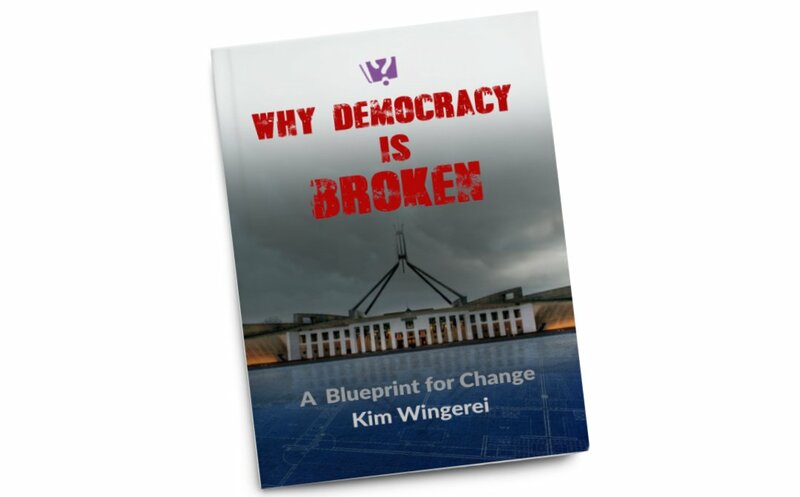 My book outlines a clear and concise plan for how to modernise our democracy, and restore our collective faith in those chosen to govern our future.